Improvements to Yas KartZone coincide with this year’s Kids Go FREE Friday #AbuDhabiGP promotion. 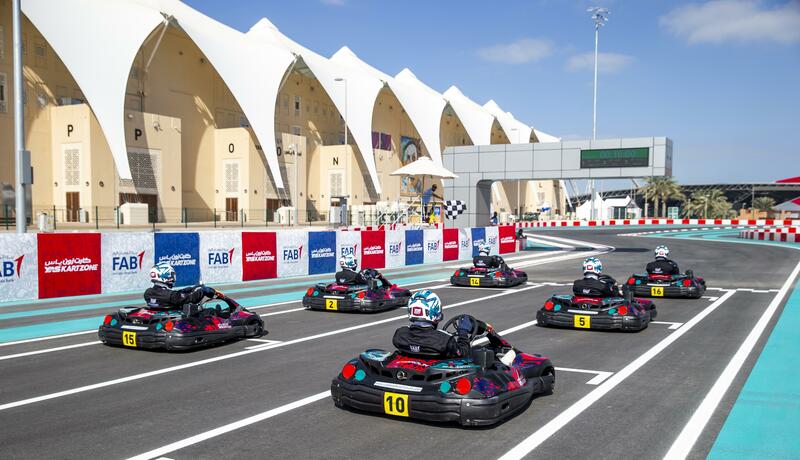 Yas Marina Circuit, Abu Dhabi, UAE 21 November, 2018: Yas Marina Circuit’s karting track has undergone a major overhaul to celebrate the 10th edition of the FORMULA 1 ETIHAD AIRWAYS ABU DHABI GRAND PRIX. In addition to an expanded kart fleet, enthusiasts will be able to choose from an increased portfolio of 14 extra karting options that takes the total to 19 different products and offers something to everyone of all ages – from ‘Arrive & Drive’ products to birthday parties, family celebrations and corporate events. The reconfigured track also enables the hosting of kart racing, with the addition of a race control, viewing area and team facilities – lending a whole new edge for more competitive visitors. Gantries have also been added to the track, making the look and feel closer to the actual F1® Circuit. Those looking to race in a more professional environment can also look forward to CIK-sanctioned racing coming soon thanks to homologation. Spectators can enjoy improved facilities, with more F&B options as well as a viewing platform added to the 1st floor of the next-door Box Park for friends and families. The improvements have been sponsored by the Circuit’s Founding Partners First Abu Dhabi Bank, and marks an ever-growing relationship between the two entities since the inaugural Abu Dhabi Grand Prix in 2009. The track has also benefited from a state-of-the-art LED lighting system thanks to new official lighting sponsor Musco, allowing for twilight and night racing. Yas KartZone is one of the most popular attractions away from the track at the FORMULA 1 ETIHAD AIRWAYS ABU DHABI GRAND PRIX. This year, there’s expected to be even more demand from youngsters determined to follow in the footsteps of F1® stars including Max Verstappen, who excelled in youth karting championships. Under Yas Marina Circuit’s Kids Go FREE Friday promotion*, with each three-day adult Grandstand ticket purchases, children 12 years and under get free access on Friday to that Grandstand and the Oasis Areas, plus free entry to Ferrari World, Warner Bros World™ Abu Dhabi and Yas Waterworld Abu Dhabi, for ticket holders with a Super Parks Pass. The all-new Yas KartZone will be open from 10am-8pm on Friday 23rd and Saturday 24th November, and 11am-8pm on Sunday 25th November, 2018.